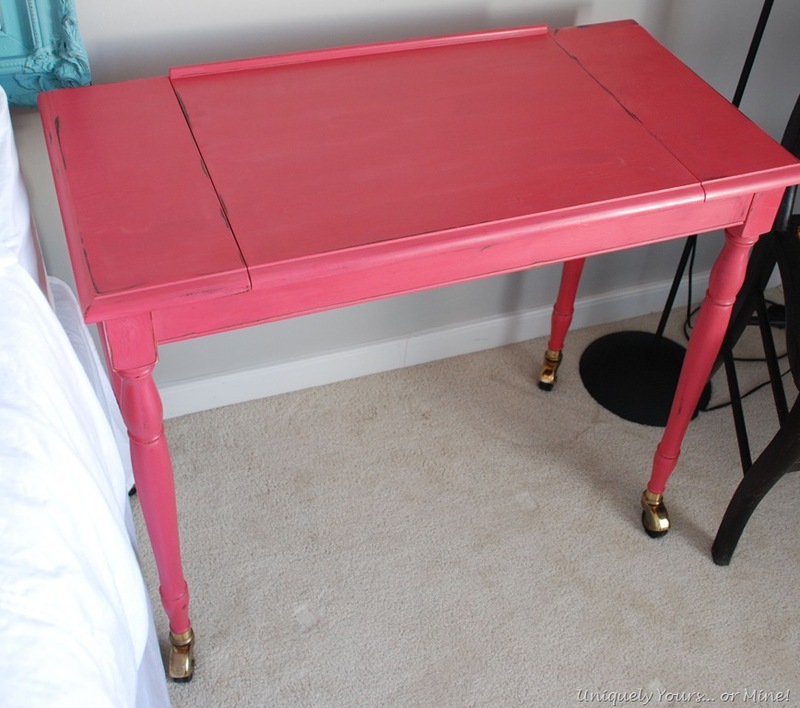 Pink Writing Desk Love – Uniquely Yours… or Mine! 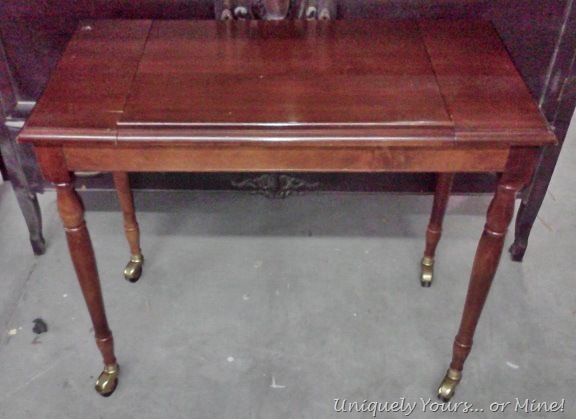 I just adore a great petite desk… and this one is no exception! It’s not very deep, has just enough details, is on wheels and has an area to stow away your “crap”… perfect! 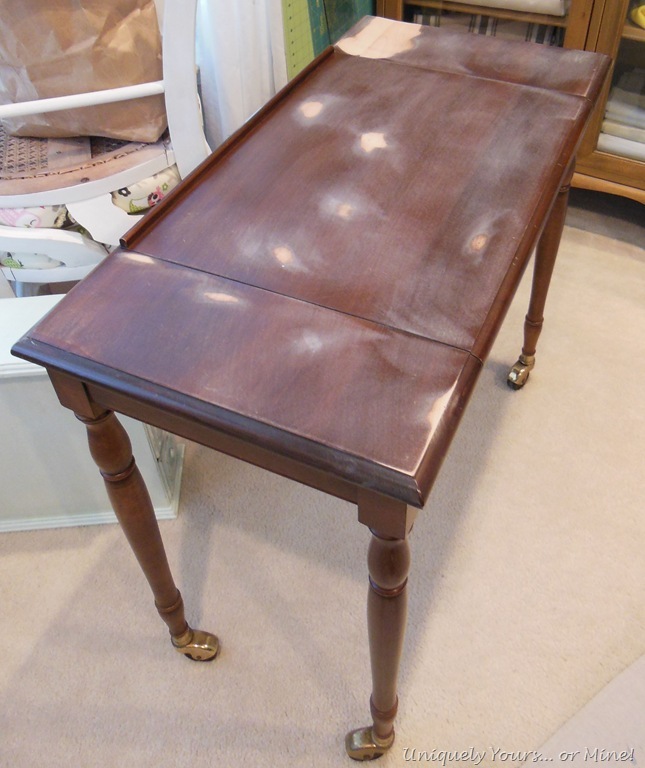 I sanded down some of the deeper surface scratches and cleaned the desk really good with Formula 409. On the inside I added some printed contact paper on the bottom and some chalkboard vinyl. I cut the vinyl out with my Silouhette machine… I think it’s a nice place to leave yourself notes! The legs have just enough shape to them to be interesting and I just love the brass and rubber wheels… it rolls SUPER smoothly! I think it would work great in place of a bedside table, which is how I photographed it. I also updated Sierra’s old lamp shade. 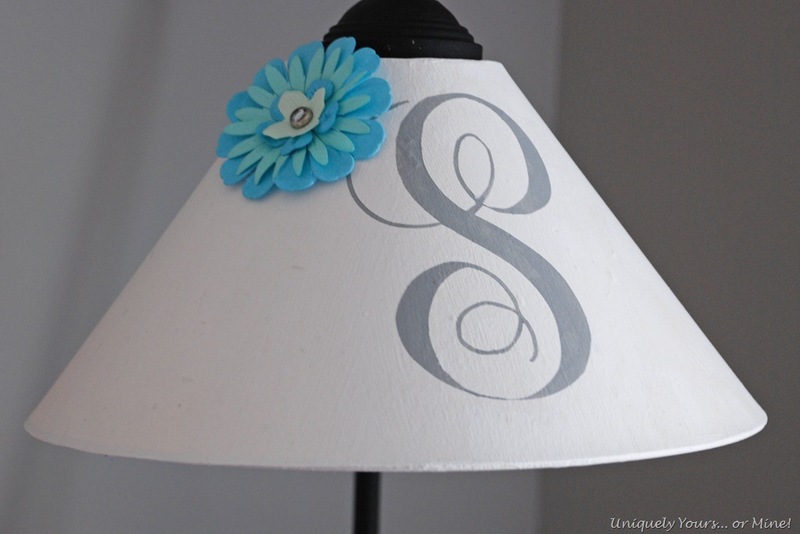 It it made of parchment paper and was a old yellow color… I painted it with Pure White chalk paint, cut out an “S” in vinyl and stenciled it with some grey chalk paint I had leftover. I also added this cute flower I made with scrapbook embellishments and a gemstone brad that I just pushed through the shade… SUPER EASY and fast! 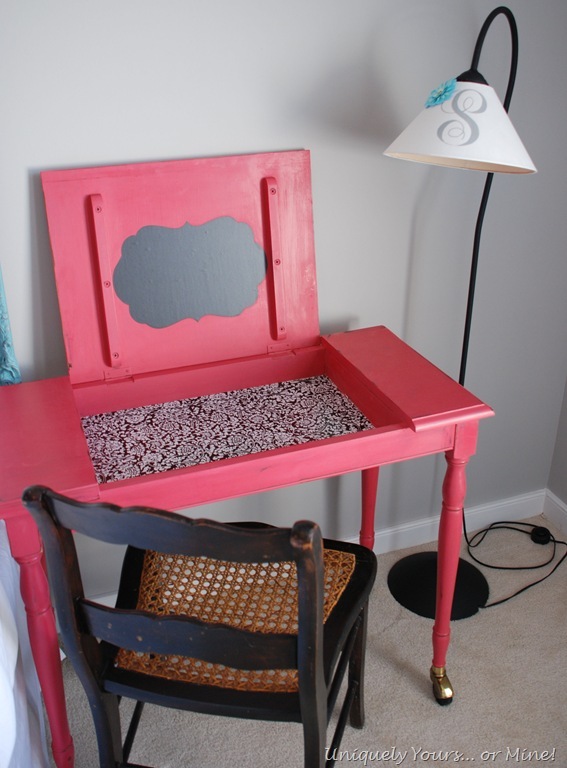 Hope you liked the pink desk and custom shade! Great re-do! 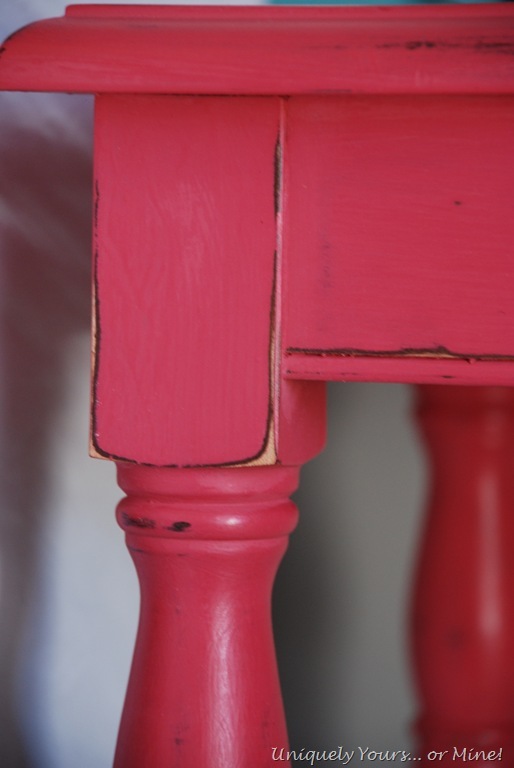 I love the yummy pink color – it has just enough blue to not be pepto-bismally; it’s just luscious! Fun desk! Thanks so much Geri! 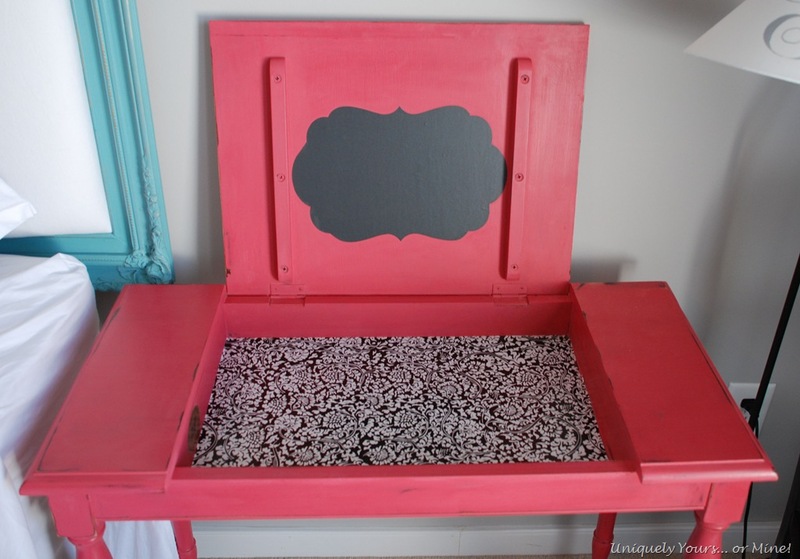 I love the color too… It’s nowhere near Pepto color! Such a cute piece and a pretty color! Thanks Sharon! I was just surprised that I could get this color from ASCP.. I really love it! How cute! 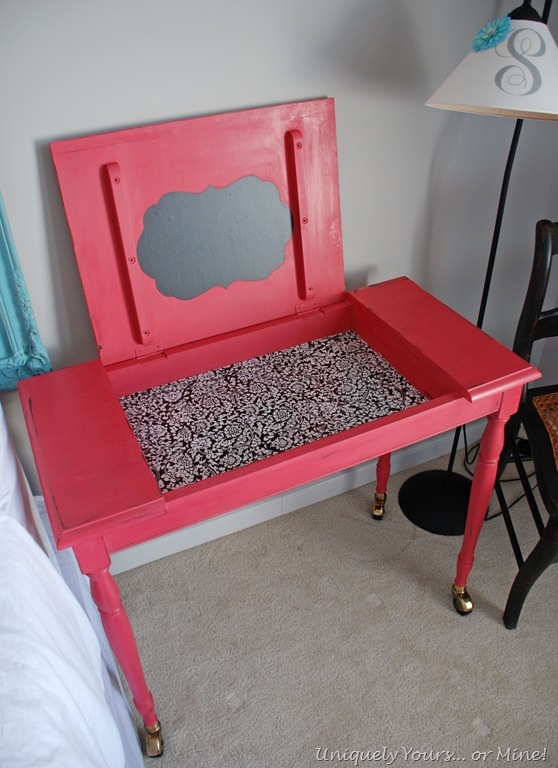 Perfect for a girl’s room. Love the touch of black inside. Hi Susan, love the desk. I emailed you several. Months ago about your kitchen cabinets as I was about to start a kitchen for a client of mine. I am about to reveal her house in the next couple of weeks and I thought you might want to see what I did. I wanted to thank you for your responding to my questions about how they are with standing the wear. Thanks again, I enjoy your posts. Thanks Peggy! I can’t wait to see them!